A week ahead of the major ad agency forecasters’ year-end forecasts, influential Wall Street analyst Brian Wieser has revised his 2018 U.S. ad growth estimates 1.7 percentage points to 6.5%, and projects 2019 will expand 4.0% vs. his previous forecast of 3.5% for next year. “2018 is turning into another strong year for the overall advertising economy, lifted by what are positive current economic trends,” Wieser explains in a note sent to investors this morning. Personal consumption expenditure growth rates: "Trending higher in 2018 relative to growth rates observed in 2017, with growth of +4.8% three quarters into this year vs. growth of +4.3% year-to-date at the same point in 2017." Industrial production: "Up by +4.1% through 3Q18, which compares with a similar year-to-date growth rate of +1.2% in 2017." 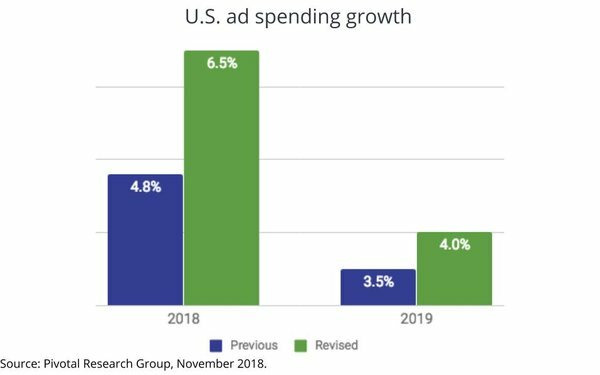 “These two economic factors are most tightly correlated with advertising growth, and so we are unsurprised if acceleration of these figures leads to acceleration in ad spending trends. After reviewing publicly media owner ad revenues through the end of the third quarter of 2018, we can see that the advertising market is also growing faster than previously expected,” he explained, adding that digital advertising will be a primary beneficiary of the economic expansion.